Skilled artisans from the Tatra Mountain region of Poland are famous for their beautiful plates made of seasoned Linden wood. This region employs centuries old traditions and meticulous craftsmanship to create a finished product of uncompromising quality. The plates are entirely decorated by hand, using various combinations of carving, brass and copper inlays, burning, and staining techniques. No two plates are exactly alike. "Hearts Around" Polish Beech Wood Floral Plate 8.75" "Hearts Around" Polish Beech Wood Floral Plate 8.75" "Hearts Around" Polish Beech Wood Floral Plate 8.75"
Polish Wooden Eagle Plate 9.75" Polish Wooden Floral Plate 12" - 30cm Dia. 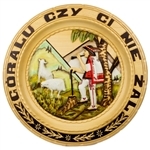 Polish Wooden Floral Plate 16.75" - 42.5cm Dia.